Leaders from the European Peoples Party (EPP) meeting in Madrid on Thursday (22 October) warned that populism was a “disease” spreading “like cancer” in the EU. This “demagogic approach”, according to Antonis Samaras, former prime minister of Greece, could have disastrous consequences for democracy. Samaras participated in the panel “Democracy under Assault: The Threat of Populism for Modern Societies” held during the EPP Congress, together with Erna Solberg, Prime Minister of Norway, Angelino Alfano, Italy’s Minister of the Interior, Pablo Casado, Spanish MP with the Partido Popular (PP), and Mikulas Dzurinda, President of the EPP think-tank (Martens Centre) and former prime minister of Slovakia. Discussions focused on populist parties like leftist and anti-system Podemos in Spain, National Front (FN) in France, Golden Dawn in Greece and the Five Star Movement (Movimento Cinque Stelle), founded by controversial Italian comedian Beppe Grillo. “Populism is not an ideology, its common denominator is demagogy. They have a simplistic way to see reality: they divide the society between the villains, their opponents, and the rest of people”, Samaras said. In a public endorsement of Spain´s Prime Minister, Mariano Rajoy, ahead of national elections to be held on December 20, Samaras expressed his hope for a sound victory for the PP, warning: “we should avoid that Spain becomes victim of the same illusion – explicitly referring to Podemos. Another topic for debate was the link between populism and the economy, and the “false promises” populist parties, right or left-wing, often make. “People want to know what´s best for their parents’ pensions. They are worried about practical issues. But the answer from populism is, Casado insisted, was “dreams and false illusions”. Populism, Alfano commented, is fuelled by financial crises. “The financial crisis in the EU has served to boost populism all over Europe. It has sparked social unrest and increased mistrust with politicians, and with the EU”, Alfano stated. As participants in the panel said, populist parties share the same narrative: a worrying attempt at redefining democracy for their own interests. “They are back to communist times. They are old-fashioned. They speak on behalf of the people, but they promise them the moon”, Casado said. Populist parties put in danger economic reforms and recovery in Europe, because they are “Nay-sayers”who rarely offer workable proposals, the centre-right panelists claimed. In that context, the EPP called to strengthen the resilience of democratic institutions by offering reasonable solutions and credibility – the only way to defeat populism and keep a sound financial recovery in the EU, participants in the debate said. “They make promises like tsunamis, but never deliver”, Samaras noted. But it is one thing is to make promises, and a very different issue to be in the government and take “responsible decisions”, Alfano stated. Populism, a catalyst for change? 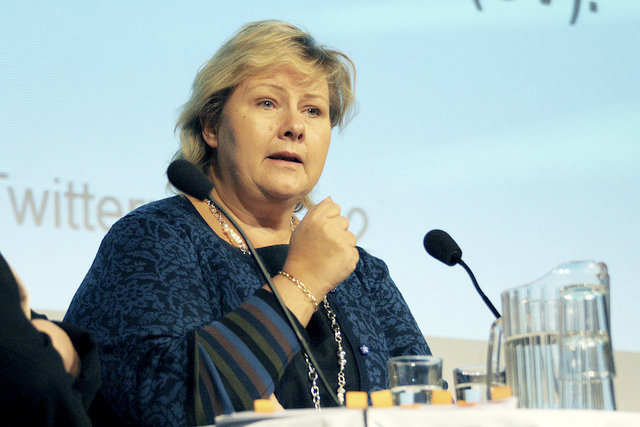 Norway´s Prime Minister, Erna Solberg, mentioned a “positive” side of populism: “they are correctives”. “Populism can trigger a process of change”, she added. In her view, populist parties are growing in Europe because politicians too often do not do their job properly: “we didn´t build enough trust. We shouldn´t worry that much about [the] economy, and focus our attention more on citizens”, Solberg insisted. However, she acknowledged that the sound economic situation in Norway allowed the Scandinavian country to re-focus on social policies and be better prepared to tackle the challenge of populism than southern and central European countries. The Congress of the European People’s Party (EPP) was held Thursday, 21 and 22 October - 2015, in Madrid, Spain. Hosted by Prime Minister and President of Partido Popular Mariano RAJOY, EPP President Joseph DAUL, and EPP Secretary General Antonio LÓPEZ-ISTÚRIZ, in the presence of EPP Group Chairman Manfred WEBER, the Congress in Madrid will involve more than 3,000 participants, including 750 delegates, 14 heads of state and government from EU and non-EU countries, and the EPP's leaders in the European institutions. Detailed information and live coverage of the plenary sessions can be found at madrid2015.epp.eu. The programme of the Congress is available here and practical information for the press can be found here. EU heads of state and government Mariano Rajoy (Spain), Angela Merkel (Germany), Boyko BORISSOV (Bulgaria), Viktor ORBÁN (Hungary), Pedro PASSOS COELHO (Portugal), Laimdota STRAUJUMA (Latvia), Enda Kenny (Ireland), and Nicos ANASTASIADES (Cyprus) will participate, along with European Commission President Jean-Claude JUNCKER and European Council President Donald TUSK. Non-EU heads of state and government Erna SOLBERG (Norway), Serzh SARGSYAN (Armenia), Nikola GRUEVSKI (FYROM), Valeriu STRELEȚ (Republic of Moldova), and Dragan ČOVIĆ (Bosnia and Herzegovina) will attend. Moreover, Vice Chancellor Reinhold MITTERLEHNER (Austria), Deputy Prime Ministers Pavel BĔLOBRÁDEK (Czech Republic) and Kris PEETERS (Belgium), Finance Minister Alexander STUBB (Finland), Minister of the Interior Angelino ALFANO (Italy), Minister of Social Protection Margus TSAHKNA (Estonia), and opposition leaders Nicolas Sarkozy (France), Silvio Berlusconi (Italy), and Janez JANŠA (Slovenia) will participate. Party presidents Mikheil SAAKASHVILI (Georgia) and István PÁSZTOR (Serbia), as well as opposition leaders Lulzim BASHA (Albania), Aleksandr MILICEVIC (Belarus), Simon BUSUTTIL (Malta), Jan FIGEL' (Slovakia), Marc SPAUTZ (Luxembourg), Sybrand VAN HAERSMA BUMA (The Netherlands), Anna KINBERG BATRA (Sweden), Gabrielius LANDSBERGIS (Lithuania), and Vangelis MEIMARAKIS (Greece) will attend. Secretary-General of Partido Popular María Dolores DE COSPEDAL GARCÍA and President of the Community of Madrid Cristina CIFUENTES will be present. Former European Council President Herman VAN ROMPUY, former European Commission President José Manuel BARROSO, President of the Committee of the Regions Markku MARKKULA, President of the OSCE Parliamentary Assembly Ilkka KANERVA, and President of the Wilfried Martens Centre for European Studies Mikuláš DZURINDA will participate. The CHALLENGE of Populism? They are not PRACTICAL people, who understand the benefits of throwing away their, nationalism, democracy, freedom, human rights and joining the rest of the slaves working under the wisdom of a world-united NWO. REALLY ?? How many associations will Norway have to join for the Populists to understand their own good? EOS - EPP - ECFR - BILDERBERG - NATO - RED CROSS - UNITED NATIONS - ILLUMINATI. Recently the ECFR made several agreements with the EU. Hvorfor utbetaler Norge store summer til Ungarn under tittelen ´The NORWAY fund´ ? (delt mellom Norge-Island og Sveits) Er det i virkeligheten en omvei til Soros´s Foundation? Our Prime Minister Erna Solberg is Hell-bent on joining Norway with the EU and their plans for the NWO, in spite of the fact that the Norwegian public voted an overwhelming NOon several occasions. We must ask the people to give their decision in a new vote NOW!! width=100%; //the width of the embedded map in pixels or percentage height=1090; //the height of the embedded map in pixels or percentage border=3; //the width of border around the map.